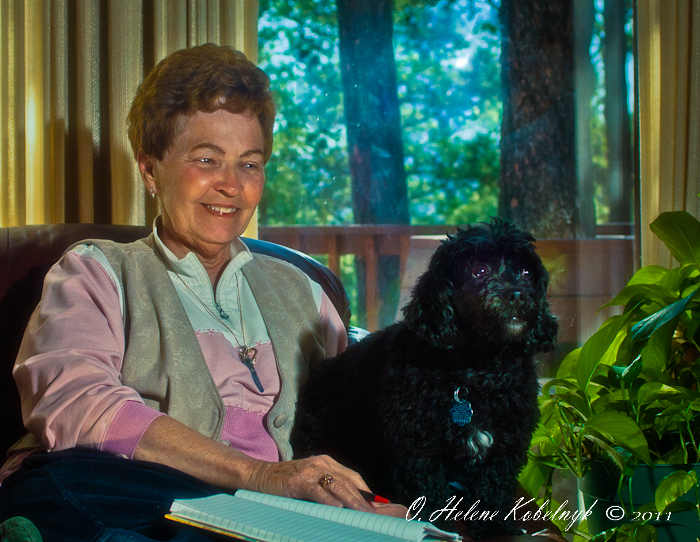 Last week I had the wonderful opportunity to photograph a very lovely and gracious lady in her home. As we were having a delicious cup of coffee, we chatted about fun stuff as well as poses and areas of the house where the lighting would be attractive for her. As I was unpacking my gear, her little dog was very interested in all my “things” but was very polite albeit interested. When I started this shoot in the living room, she sat unobtrusively for a while and simply observed. Then, to the surprise of both of us, she decided on her own that she would be part of the photo. She posed herself and I snapped. Always let the photo evolve. Yes, you have to have a vision, but never overlook an unexpected opportunity by being too focused. Dogs are so amazing . . . but I’ll leave that for another post! I don want to just say it’s great as usual, I really like the portrait, you are one fine photographer! Nice write-up, Helene! Is that a “Schnoodle”? My mother has a dog like that, and he definitely likes to be the center of attention too!